We found 1118 results matching your criteria. Who says you canÍt be all things to all people? 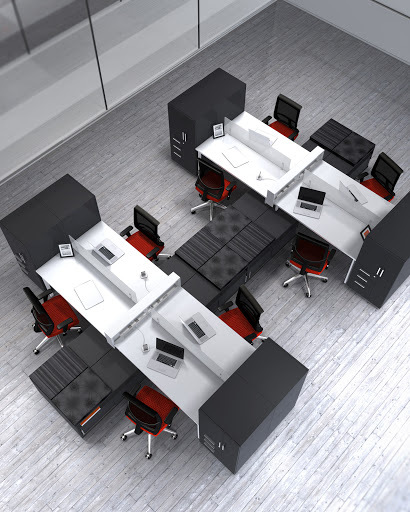 e5 is the go-anywhere, do-anything furniture solution that can be used to furnish everything from private offices and open plan spaces to benching applications _ all while promoting productivity and collaboration. e5 is Easy to Afford for even the smallest companies. Because itÍs also Easy to Reconfigure , adding workers and transforming work environments is a piece of cake. You can re-purpose components into entirely new applications and expand office layouts with minimal disruption. Bulk up storage. Diversify function. Add more power, anywhere you want it. Whatever your needs, now and in the future, you can count on e5 for an easy solution. Power is routed from the source and up to the worksurface via our innovative Technology Beltway. Power kits can be added and reconfigured any time, with virtually no tools required. This feature saves substantial installation costs. Worksurfaces in Designer White, Wardrobe Towers in Raven, and Storage Cabinets in Raven with Delve Black and Veer Black fabric Cushions. Commute» Chairs in Flection Tango fabric. Freestanding casegoods include a variety of layered- and desk-height Base Units as well as Wardrobes and Bookcases. All are equipped with metal legs to facilitate floor cleaning. Power and data outlets are placed within armïs reach while an integral trough below the worksurface conceals cabling. Storage Cabinets are two-sided _ an open or doored compartment on one side and a Markerboard or Tackboard on the other, so theyÍre functional from either direction. e5 animation from Mayline on Vimeo. Mayline e5 collection is the go-anywhere, do-anything furniture solution that can be used to furnish everything from private offices and open plan spaces to benching applications _ all while promoting productivity and collaboration. Mayline e5 collection is the go-anywhere, do-anything furniture solution that can be used to furnish everything from private offices and open plan spaces to benching applications - all while promoting productivity and collaboration. 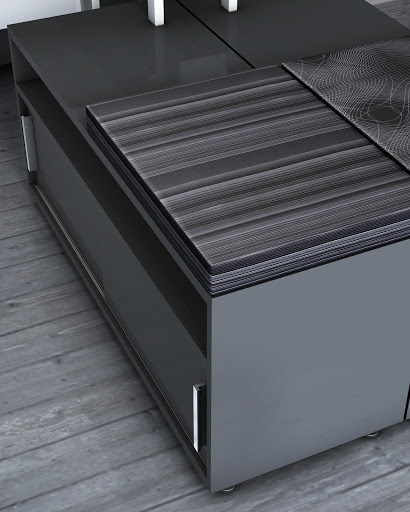 Desktop Power and Data Technology - Mayline e5 office furniture is the go-anywhere, do-anything modular solution that can be used to furnish everything from private offices and collaborative open spaces to benching applications. 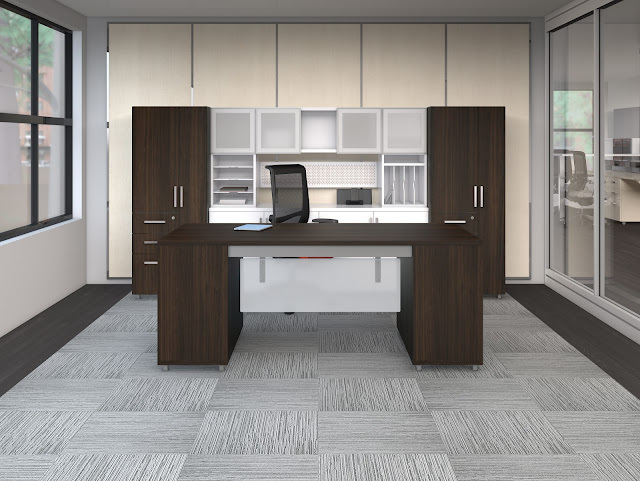 The e5 modular furniture will grow with your organization as it enhances office productivity and helps save your budget. Rectangular Desk 72"W x 36"D - Mayline e5 office furniture is the go-anywhere, do-anything modular solution that can be used to furnish everything from private offices and collaborative open spaces to benching applications. The e5 modular furniture will grow with your organization as it enhances office productivity and helps save your budget. Rectangular Desk 60"W x 36"D - Mayline e5 office furniture is the go-anywhere, do-anything modular solution that can be used to furnish everything from private offices and collaborative open spaces to benching applications. The e5 modular furniture will grow with your organization as it enhances office productivity and helps save your budget. Rectangular Desk 72"W x 30"D - Mayline e5 office furniture is the go-anywhere, do-anything modular solution that can be used to furnish everything from private offices and collaborative open spaces to benching applications. 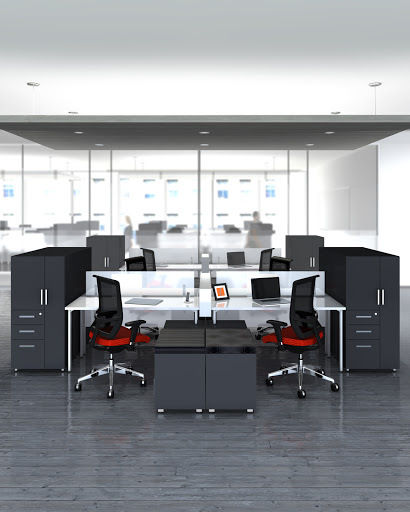 The e5 modular furniture will grow with your organization as it enhances office productivity and helps save your budget. Rectangular Desk 60"W x 30"D - Mayline e5 office furniture is the go-anywhere, do-anything modular solution that can be used to furnish everything from private offices and collaborative open spaces to benching applications. The e5 modular furniture will grow with your organization as it enhances office productivity and helps save your budget. 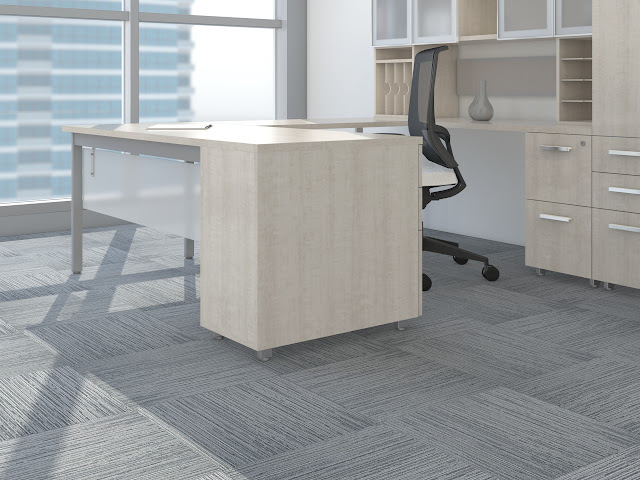 Worksurface Credenza - Mayline e5 office furniture is the go-anywhere, do-anything modular solution that can be used to furnish everything from private offices and collaborative open spaces to benching applications. The e5 modular furniture will grow with your organization as it enhances office productivity and helps save your budget. 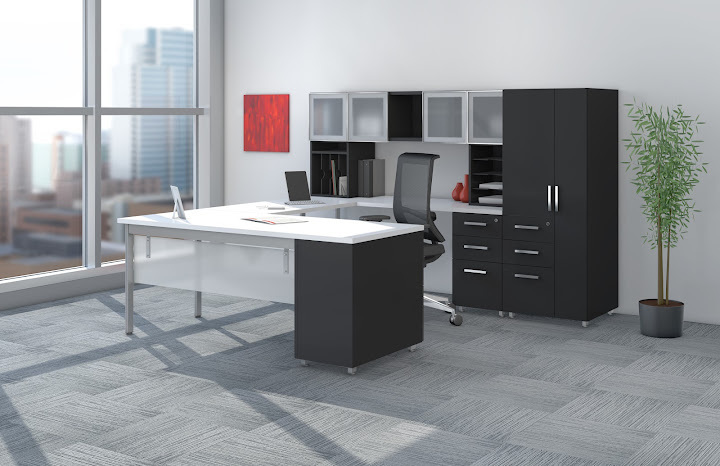 Office Storage Cabinets - Mayline e5 office furniture is the go-anywhere, do-anything modular solution that can be used to furnish everything from private offices and collaborative open spaces to benching applications. The e5 modular furniture will grow with your organization as it enhances office productivity and helps save your budget. Hatchet-Shape Desk 72"W x 24"D - Mayline e5 office furniture is the go-anywhere, do-anything modular solution that can be used to furnish everything from private offices and collaborative open spaces to benching applications. The e5 modular furniture will grow with your organization as it enhances office productivity and helps save your budget. Rectangular Desk 48"W x 30"D - Mayline e5 office furniture is the go-anywhere, do-anything modular solution that can be used to furnish everything from private offices and collaborative open spaces to benching applications. The e5 modular furniture will grow with your organization as it enhances office productivity and helps save your budget. Easy to Specify. e5 offers a logical, intuitive structure along with a minimum number of parts _ so specifying is simple, quick and slick. ItÍs almost impossible to get it wrong ƒ but help is just a phone call away if you need it. Easy to Install. We know time is money _ so we put a whole lot of brainpower into designing uncomplicated connections. Modular units, for example, simply slide and lock securely into place, requiring minimal tools and fasteners. Easy to Power. This is where e5 really excels. Our patent-pending Technology Beltway takes power throughout any configuration, seamlessly and transparently ƒ even after the system has been assembled. Connections are all easily made from a seated position. Easy to Reconfigure. e5 prepares you for whatever the future may bring _ because itÍs a cinch to rearrange, reuse and reinvent your space as conditions dictate. TodayÍs bench can become tomorrowÍs executive desk ƒ or vice versa. Easy to Afford. e5 delivers superior technology integration, exquisite fit and finish, and an all-around user-friendly experience that simply cannot be matched at this price point. Go ahead and compare us to the rest! More and more of todayÍs workplaces require a level of collaboration that panel systems just wonÍt allow. e5 delivers the space-saving footprint and expansive power capabilities of a panel solution in an environment that promotes interaction, without the isolating walls. Easy-to-Power features include Technology Beltways and a variety of 8-wire/4-circuit Power Kits that will accommodate even the most tech-intensive environments. Benching applications make extremely efficient use of real estate while promoting collaboration. e5 makes benching even more comfortable and productive with options for standing-height worksurfaces and overhead storage. Worksurfaces cantilever into position and storage components simply slide and lock into place atop our Technology Walls _ the load-bearing equivalent of our Technology Beltways. ThatÍs just one of many Easy-to-Install touches! e5Ís common-sense approach to building a workspace makes it just as Easy to Specify private offices as collaborative environments. A variety of freestanding and wall-mounted components let you create near-endless configurations, in colors and finishes that range from traditional to ultra-modern . Use e5 throughout your office to create a unified look, feel and function while enhancing your Easy-to-Reconfigure flexibility.